Our organisation is committed to human rights and community relations issues affecting the Arabic culture and profile. You will note that we undertake a combination of proactive and reactive projects, whereby we are vigilant to changes in our environment, while endeavouring to make it a better place to live for all of us. We trust that your journey into our web site will be enlightening and inviting, as we welcome your participation and contribution to any of our initiatives. 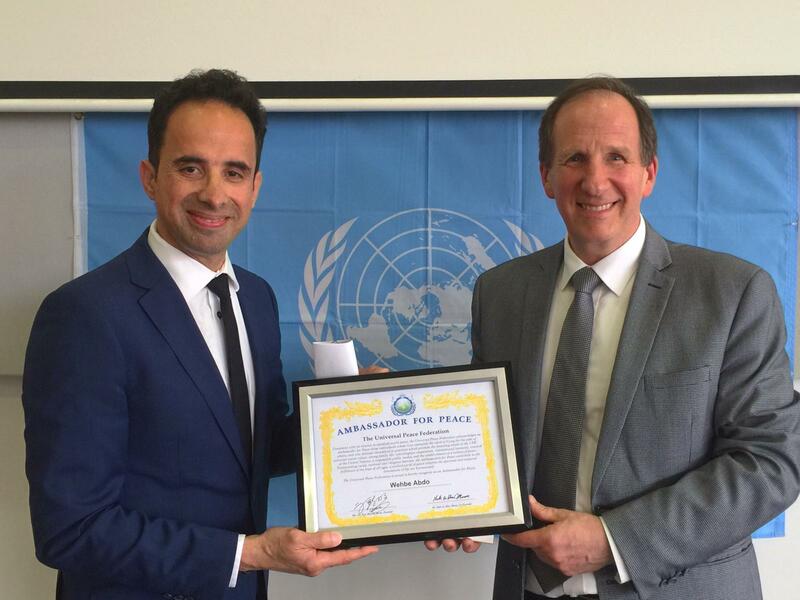 20 October 2018, AAC Executive Director Will Abdo was today honoured with the prestigious award of “Ambassador For Peace” in recognition for his dedicated work and peace building efforts across both community and business platforms to enhance Australian Arabic relations. The award was presented by the Vice-President of Universal Peace Federation Australia Dr John Bellavance (pictured above right). Many community leaders attended the award ceremony including fellow Ambassadors, members of the clergy and academia, family and friends, which was held at Clayton Church of Christ, Melbourne. The Universal Peace Federation is an NGO dedicated to achieving world peace in special consultative status with the Economic and Social Council of the United Nations and supports the work of United Nations, particularly in the areas of interfaith peacebuilding, peace education, and the strengthening of marriage and family. Congratulations Will on a well deserved award. 22 September 2018, AAC attended the UN International Day Of Peace Conference at Church of Christ in Clayton, Melbourne presented by the Universal Peace Federation and the Women’s Federation for World Peace Australia addressing and promoting world peace. The event included participants being involved into the Bridge of Peace ceremony: an empowering ceremony that enabled personal bridges of reconciliation and healing. It was an opportunity to connect in heart with people from different cultural background, heal wounds of the past, build lasting friendships, and resolve conflict passed on from generation to generation. Also an interesting perspective on world peace building was presented by the Institute for Economics and Peace using its Positive Peace research via quantifying formulated models as world peace indicators! A signature project of WFWP International. 11, 18 AND 25 September 2018, the AAC attended a series of seminars by Professor Joseph Camilleri at St Michael’s on Collins, Melbourne addressing concerning trends in Western societies – Australia included. . It covered issues on the diminishing value attached to truth and social trust in public life and its consequences on many Western Institutions which seems virtually paralysed, unable to respond effectively or empathetically to climate change, other environmental challenges, rising social and economic inequalities, cultural tensions, refugee flows, violations of human rights, human trafficking, armed conflict, the misuse of science and technological innovation, and much else.